The holographic anchovy is an all purpose pattern that is effective on everything from trevally to kahawai and kingfish that feed on small baitfish. It works exceptionally well when cast to feeding fish and retrieved rapidly away from them. There is nothing quite like seeing a big predator lock onto the fly and watching a V wake surging in behind as you retrieve at high speed. Hook: Mustad 34007NPSS. Size 1/0 to 3/0. I generally like to ensure that the completed fly is 7.5 – 9.0 cm long from head to tail and match the hook accordingly. 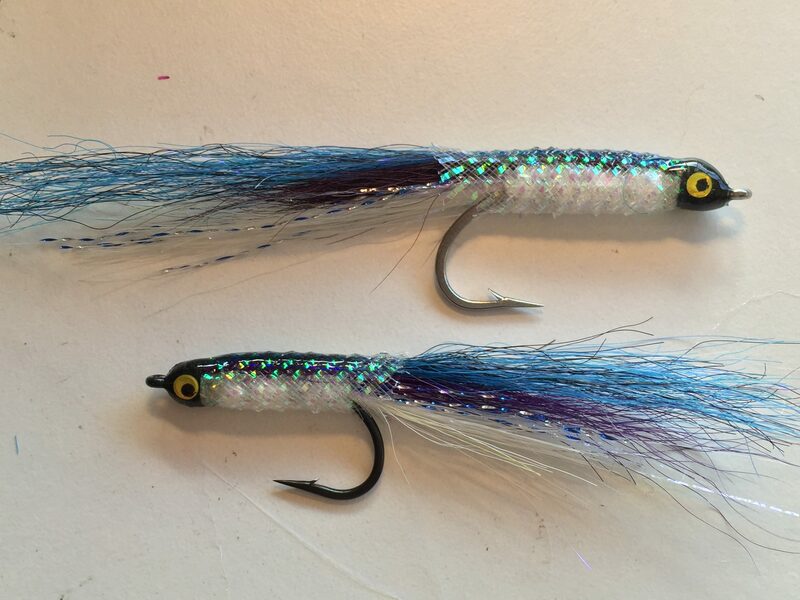 Tail: Pinch of Hareline Dubbin White Fishair topped with an equal amount of Hareline Dubbin UV Minnow belly and small pinch of Holiday Blue and Silver variegated tinsel. See below. Wing: Bottom layer of Hareline Dubbin Purple Fishair topped with Enrico Puglisi Game Change Fibre (Mackerel blend). Pinch of each. The wing length should match that of the tail. Overbody:- Cover body and wing with a length of Hareline Dubbin E-Z Body Medium Pearl. This locks the wing down onto the chenille and creates the seductive bait fish profile. Make sure that you align seam of E-Z Body along top of the hook shank. Coat the head of the fly with Zap-a-Gap before sliding on the tube. Overwrap end of E-Z Body with thread to form head and lock in place. Position eyes and coat with UV epoxy. It is important to also coat the top of the tube over the wing with UV epoxy so that it reflects the light internally and optimises the holgraphic effect. I like to let the first coat of UV epoxy soak in well before hardening with the UV torch. Apply at least two coats of UV epoxy for best results.